By ICSSI Baghdad, April 2016. “We depend on our water and our land. Our land is useless without water. Our environment thrives thanks to water. However, because of droughts we have low water levels in certain seasons, and then it seems all life has left. People leave the countryside and migrate to the city. We feel the government does not care about us”. 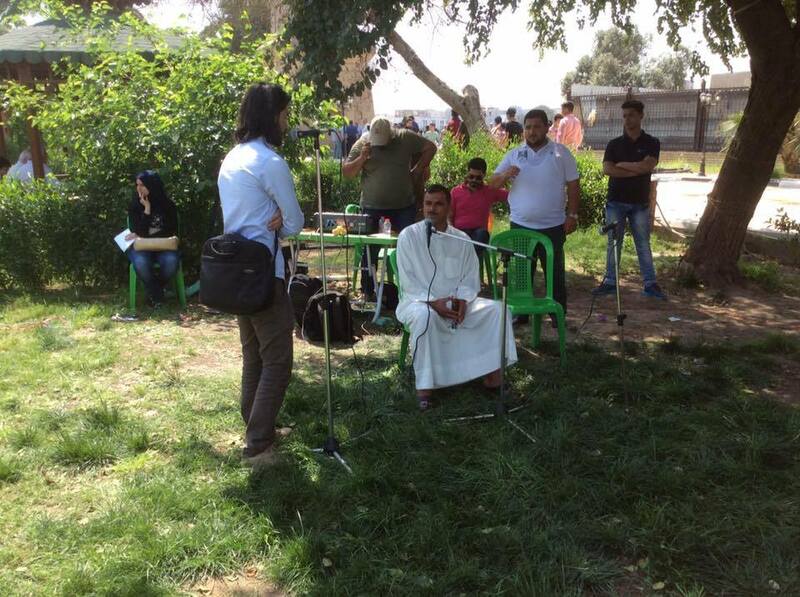 This is how one of the locals described the situation in the Iraqi Marshes, representing the inhabitants of the Marshes at the “Humat Dijla” Festival in Baghdad on the 8th of April, 2016. It was organized as part of the International Day of Action for Rivers by a group of activists who call themselves “Protectors of the Tigris River”. 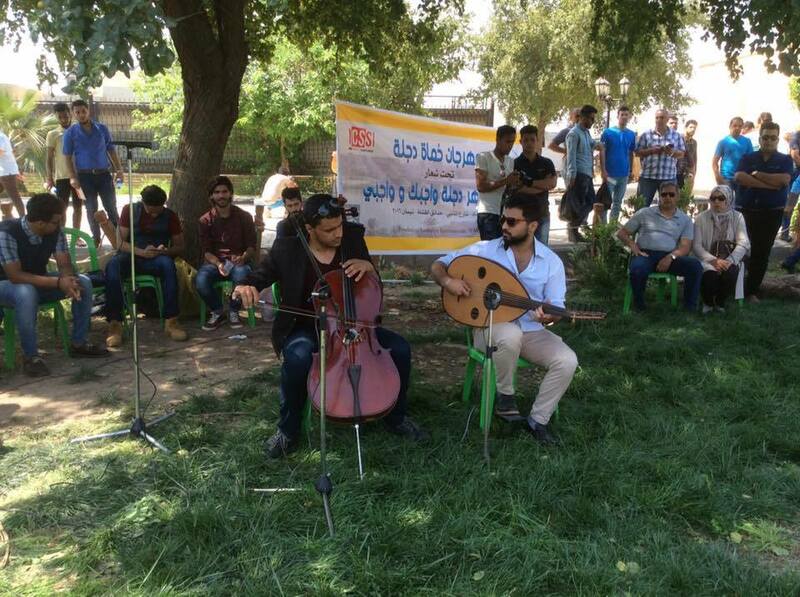 More than 300 people attended the Humat Dijla Festival, as part of the Save the Tigris and Iraqi Marshes Campaign, in cooperation with the Iraqi Social Forum (ISF) and the Iraqi Civil Society Solidarity Initiative (ICSSI). 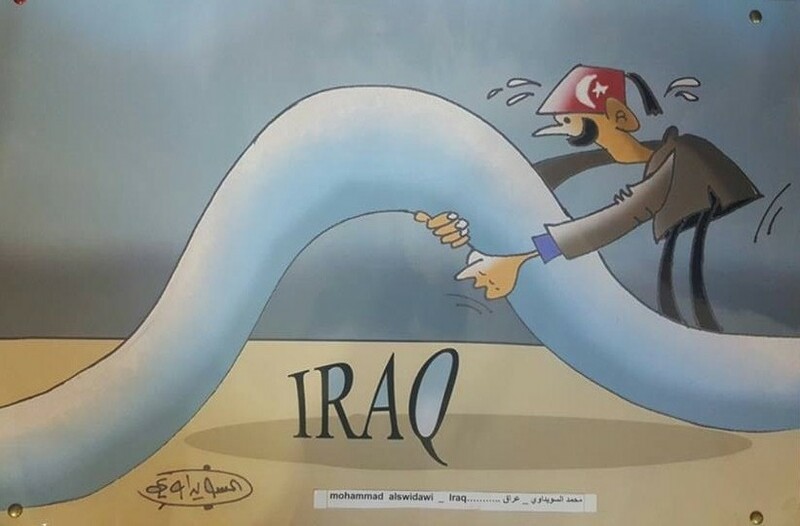 Under the banner of “Saving the Tigris: my duty and yours” the Festival focused on the poor state of Iraq’s water resources and cooperation over water shares between the countries of the Tigris and Euphrates River Basin. 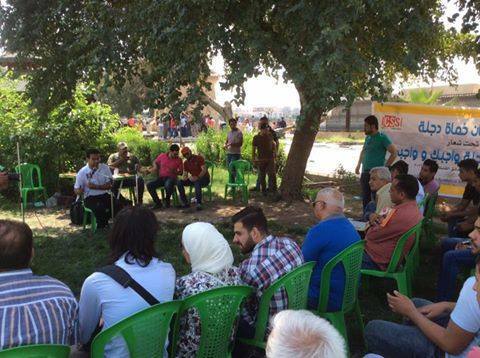 This festival was part of a continued effort of Iraqi civil society to spread awareness among the Iraqi population on the negative impact of large dams on Iraq’s water resources, and the need to protect the Tigris River and the Marshes. The goal is to create a sense of urgency among Iraqi people for better water policies. Local people from the governorates in the Tigris River basin south of Baghdad were invited to speak during the festival, to testify on the current state of the Tigris River. For instance, Mr Raheen Ghanem, a hunter from the Alkhla part of Maysan governorate, explained the impact of decreasing water levels on animal species: “During periods of relatively low water levels in the Marshes, high salinity levels cause the extinction of many kinds of fish and disappearance of birds that used to have a large presence in the region.” Mrs Eltfat Lefta and Salma, crafters from Alkhthat in Nasiriya governorate, prepared an exhibition with local handmade objects which were crafted by a local women farmers group. 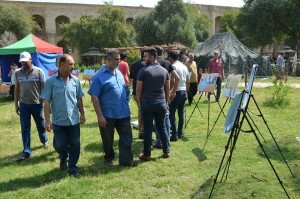 The aim of this exhibition was to present the unique skills and crafts of these women to a general audience, hereby demonstrating how much tourism Iraq could offer if groups such as these were given more support. Music was performed by local bands, such as “For Peace”, a group performing traditional and contemporary music, much to the excitement of the attendants. 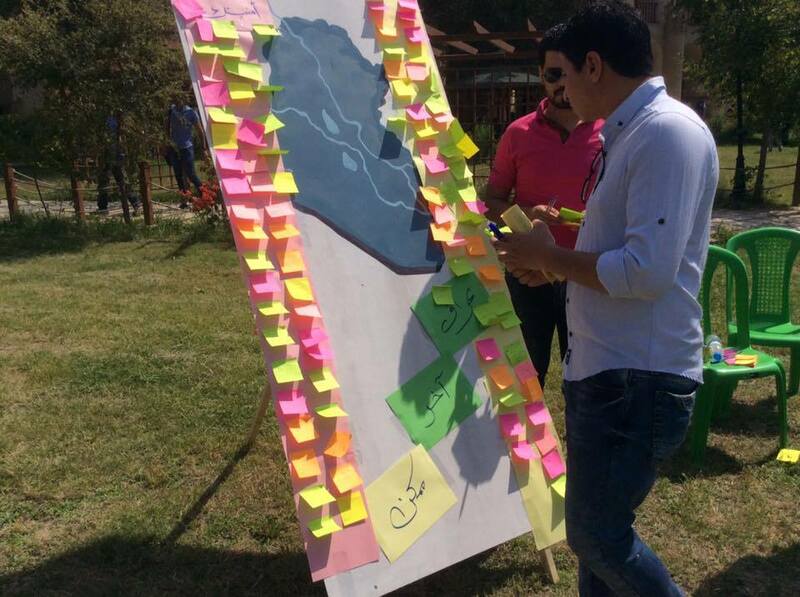 Further interactive activities took place, including a poster of the Tigris River where participants could leave a hand print and another activity during which participants could write down their wish for a future Iraq and stick it on a map of Iraq. 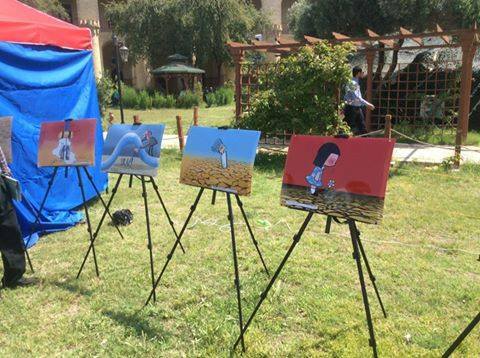 Meanwhile, the “House of Caricatures” organized an exhibition of their works, produced by Iraqi as well as international artists. 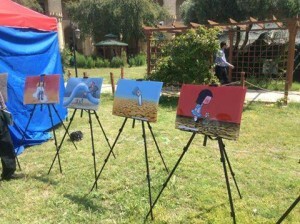 The artworks included caricatures satirizing Iraq’s current water policies, and the regional power balance over water resources. The Humat Dijla group had prepared a tent where information about the Save the Tigris Campaign was provided. 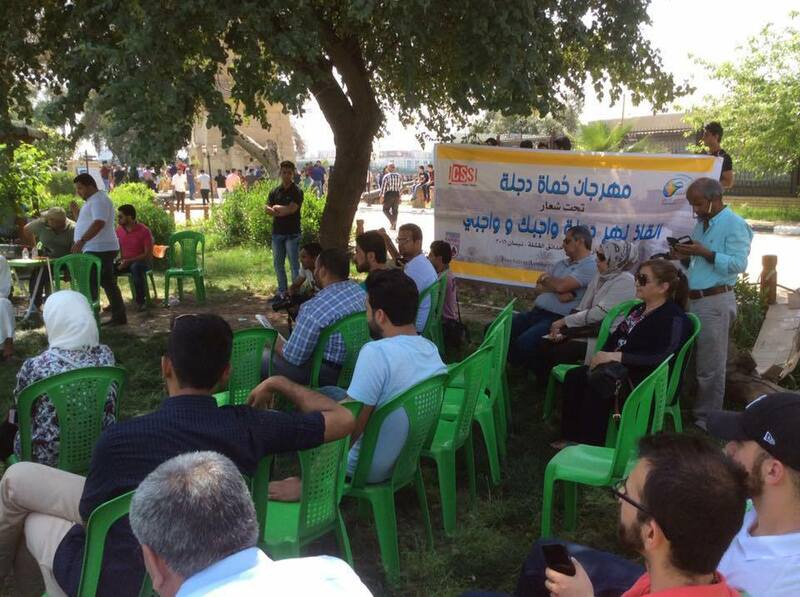 Many attendants expressed their interest in the issue of large dams and the campaign, and indicated their willingness to participate in future activities. During the festival, Ahmed Muhamed from the “Humat Dijla” team presented a report on Ilisu and other large dams which are currently under construction in Iran and Turkey. Ahmed indicated the destructive effect these dams would have on Iraq: causing further water crises and desertification. He voiced his concern that Iraq will face a double crisis: increasing droughts and decreasing water levels. This is why Iraq should halt the construction of large dams which are being built without any consultation of the Iraqi people and without any indication of their impact on the population of Iraq. Ilisu and other large dams currently under construction in Turkey pose a danger to Iraq. They are the largest threat the Tigris River faces in our time. These dams would greatly affect the environment of Iraq as water levels decrease, causing drought and desertification. The Marshes would be the most affected area in terms of damage. The activists of Humat Dijla are anxiously waiting for the next UNESCO World Heritage meeting, which will take place in Istanbul, Turkey, in July. They demand the members of the UNESCO World Heritage Committee to approve the request of Iraq to include the Marshes in the World Heritage List. This would greatly enhance the protection of these wetlands. For more photos click here, and to see a video about the event click here.